This 40 S&W cartridge by SinterFire features a 105 grain frangible bullet. Because the lead-free projectile is made of compressed copper and tin powder, it disintegrates into practically harmless nothingness on impact rather than posing the risk of a dangerous ricochet. 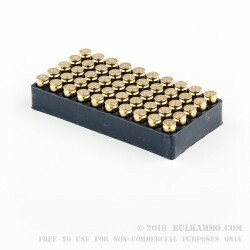 The result is a round that you can safely fire at metal targets, making this the ideal round for plate shooting. 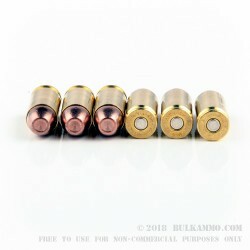 This round additionally offers a Boxer primed brass casing that is fully reloadable, and the manufacturer also sells their frangible bullets direct should you opt for them again. Interestingly, the frangible bullet owes its creation to the midway shooting galleries of old time amusement parks -- the carnies found that they’d lose a customer every time a bullet bounced back at one, so they called for the development of a ricochet-free projectile. SinterFire now makes the most popular frangible bullet in the world, a distinction that the company which originated this version of the lead-free copper and tin projectile takes great pride in.